Beers brewed only once, for meaningful collaboration, for fun and experimentation and for special occasions. The name NOLA derives from St. Arnoldus, the patron saint of brewing, the female version of the name and a beer brewed to celebrate International Women's Day on 8 March 2019. It is a collaboration with Kim van Opdurp (Zytholicious); Katrien Bruyland (Epicuralia); Daniella Provost (DOK Brewing Company, Ghent); and Leen Geers (Dranken Geers, Oostakker). The beer is a hoppy weizen of 5% ABV, a golden German ale with esters of banana and clove and a melon and peach hop aroma from the use of the Belma in dry hop additions. Hazy Daisy is a hybrid of a wheat beer, a Belgian Tripel and an English bitter, the result being a fruity, creamy, bitter-sweet ale of 8% ABV. Malted wheat makes up 45% of the grain bill to deliver an attractive haze, and subtle additions of vanilla contribute to a luscious mouthfeel. EMWIKC is a collaboration with Hedonis Ambachtbier and Or Coffee, a viscous, creamy and intense beer, mashed ridiculously thick with a hefty grain bill, no sparging and adding bags of fresh oyster shells to the two humongous gyles. We added Blida coffee in espresso and cold brew additions, a naturally processed, direct fair trade coffee from the Guji region of Ethiopia. The beer is a collaboration with Totem, a smoked rye IPA brewed using 30% beechwood smoked malt, 30% rye malt and 40% pale ale malt. It's hopped with Columbus, Cascade and Chinook and dry-hopped with Columbus (pellets) and Simcoe and Cascade in the form of Cryo Hops®. Osschaert is a full-bodied beer with a grassy, subtly smoked flavour and resinous, tropical hop notes. Ambiorix led a small Belgian tribe to victory over the Roman Empire. It was the greatest and most humiliating military defeat ever suffered by Julius Caesar and his soldiers. Our 100th brew—Centurion—is a collaboration to mark our second birthday. In the words of Caesar: "Horum omnium fortissimi sunt Belgae,"—"Of all these, the Belgians are the strongest." Centurion was brewed in collaboration with ‘t Verzet, Hof ten Dormaal and Armand Debelder. On a base of the soft, biscuity flavours of a relatively classic Saison malt bill (pils, munich, dark wheat, light wheat, barley flakes, oat flakes), we’re combining the citrus qualities of our yeast strain with the tropical and stone fruit juiciness associated with the “New England” moniker, not to mention its low bitterness, late and dry hop additions in huge quantities and fruit juice hop haze. Siphonneur was brewed in collaboration with Brussels café Le Barboteur for the occasion of their third birthday, an important beer bar located in an old library in Schaerbeek. Siphonneur is a light gold, crisp and crushable ‘Belgian Kölsch-Style Ale’ of 4.5% ABV, inspired by the top fermented but lagered hybrid beers produced around the German city of Cologne as defined by the Kölsch Konvention of 1986. It showcases a 100% pils malt base, Citra and Mandarina Bavaria hops and a subtle fruity yeast character. The Hutwe coffee variety was sourced directly by Or Coffee from a small Congolese community washing station in the Virunga National Park. The bright citrus-zest fruitiness of both the coffee and the beer compliment each other, with the Saison’s dryness accentuating the coffee variety’s subtle stone-fruit acidity. ‘Stinker’ is a top fermented beer, brewed very much as a Belgian ale (multi-step mash and bottle conditioned), but using Beechwood Smoked Malt from Weyermann® Malts in Bamberg (35% of the grist bill) to equip it with its subtle smoked bacon aromas and flavours. The cigar on the label is not only a reference to the smokiness of the rauchbier, but as something which is associated with the celebration of a special occasion, like the first birthday of a brewery. 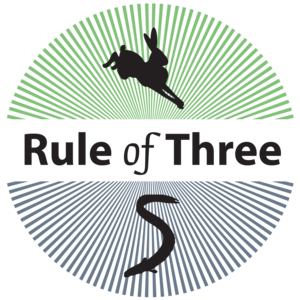 Brewed especially to celebrate the third birthday of blog ‘Belgian Smaak’, Rule of Three is a collaboration with Kinnegar Brewing in Ireland, based around the concept of ‘Three’. Three malts were used (pils, carapils and rye). Three hop varieties were deployed (Saaz, Hallertauer Mittelfrüh and Hallertau Blanc). Three yeasts were pitched (English Ale and Mild Dark Ale in primary and a neutral conditioning yeast for refermentation in the keg). The beer was dry-hopped three times. It finishes at 3.3% Alcohol By Volume. We’re left with a crisp, fruity and easy drinking ale that punches well above its weight.